An eleventh-hour rescue to save a rare Dubuque “yard grotto” will ensure its future as a link to a larger regional tradition. With a strong history for preserving grotto environments such as this, the Kohler Foundation, Inc., in Kohler, Wis., has stepped in and acquired the yard grotto created by Madeline Buol. The grotto will be moved to KFI’s conservation studio and restored before moving to its final location, yet to be determined. 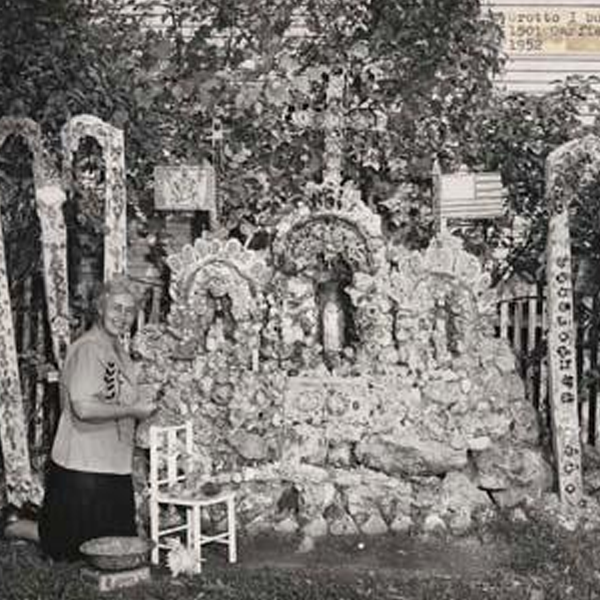 Madeline Buol (1902-1986), built her grotto, a conglomeration of embellished concrete typically with a religious theme, in her back yard on Garfield Street in Dubuque in the late 1940s and early 1950s. The home, which remained in the family until recently, was sold to new owners who were not interested in keeping the grotto. Lisa Stone, curator with the Roger Brown Study Collection (The School of the Art Institute of Chicago) and author of Sacred Spaces and Other Places: A Guide to the Grottos and Sculptural Environments of the Upper Midwest (1993), came across the Buol grotto while conducting research. Upon learning of its impending fate, she began reaching out to colleagues in the hopes someone would take an interest in saving the work. The first three major grottos in the region – Grotto of the Redemption (West Bend; blt. 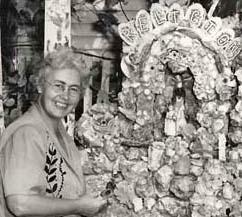 1912-1954), Dickeyville Grotto (Dickeyville, Wis.; blt. 1925-1931) and Rudolph Grotto (Rudolph, Wis.; blt. 1919-1983) – were all built by priests with some help from mostly male parishioners. Women were involved in some of the “spin off” grottos, such as the Paul and Matilda Wegner Grotto (Cataract, Wis.; blt. 1929-1942), and Mollie Jenson’s Art Exhibit (River Falls, Wis.; blt. 1938). It was easy to see why it should be preserved. The main part of the Buol grotto is clearly a reference to Father Mathias Wernerus’ famed Dickeyville Grotto, about 15 miles away. Buol flanked her Grotto (ostensibly to the Blessed Virgin) with beautifully embellished renditions of the American and Papal flags, and shells arching over flanking side shrines with the words “Religion” and “Patriotism.” One of the striking aspects of the Dickeyville Grotto was the pairing of the American and Papal flags, which stated Catholics’ loyalty to the country as well as to the Vatican, which was especially important in the post-war years, and Buol picked up on this bold expression while flanking her grotto with wonderfully precarious, tall concrete rosaries. The Kohler Foundation, Inc. supports education, arts and preservation initiatives in Wisconsin. Since the late 1970s, the preservation of folk architecture, art environments and collections by self-taught artists has been the major focus of the Foundation. 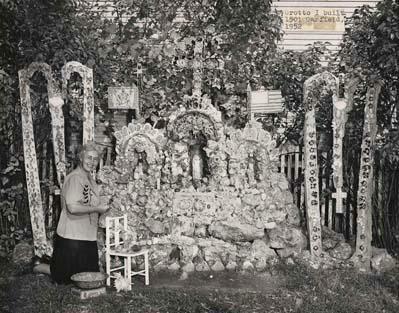 Top photo: Dated 1952, Madeline Buol appears next to her grotto for this photo which appeared in the Dubuque Telegraph-Herald. It’s great news that Kohler, the maker of quality acrylic bathtubs as well as other kinds of bathroom needs, actually show their efforts in preserving timeless treasures.